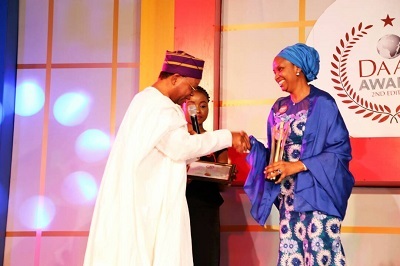 You are Here:Home/NPA MD ADVOCATES MORE VOCATIONAL TRAINING FOR YOUTHS; BAGS AWARDS. The Managing Director of Nigerian Ports Authority, Hadiza Bala Usman, has advocated for the provision of adequate vocational training for the youths of Nigeria by all tiers of government in order to equip them with skills needed for gainful employment. Usman who bagged an Award for outstanding Leadership in Public Sector Transparency and Open budget System also made case for the establishment of more vocational training institutions so as to accommodate many youths who are willing to acquire skills that will make them self-employed. The Managing Director made the call while contributing to a national discourse on youth employment organized by Daar Communications Plc, owners of African Independent Television (AIT) at the Ladi Kwali Hall of Sheraton Hotels and Towers, Abuja recently. Tagged: Youth Unemployment: a time bomb? As part of activities marking DAAR Awards 2017 and had Mrs Seinye Lulu Briggs as keynote speaker and Professor Akpan Ekpo as the Chairman of the occasion. Hadiza Bala Usman commended the keynote speaker for her detailed description of the youths in Nigeria and noted that it is a gross misconception to regard a Forty (40) year old person as a youth because at that age, they are no longer vulnerable. While stressing for local, states and federal government to utilize and appreciate the youths which she said constitute 70% of the Nigerian population, she called for enactment of policies that will help the youths actualize their dreams. She asserted further that it is not possible for government to employ all youths, but that government should provide policies and Legal Framework that can promote the manufacturing sector which can provide employment for the youths. The Managing Director advised government to look into the entertainment of the film industries, citing the case of the United States of America (USA) where about 600 companies created employment for the population, pointing out that this will provide solution to youth’s restiveness. Finally, she urged government to explore sports sector of the economy, which she described as very huge, noting that militancy, Boko Haram are products of youth neglect, and that the sports sector is an area that will also provide veritable employment for the youths.